It’s 1976, and guitar player Daniel Travers is twenty. He lives in a suburb of Sacramento, wrestling with the loss of his brother in Vietnam, an alcoholic mother, a dependence on speed and a very dysfunctional band who might be either on the brink of making it or on the brink of complete implosion. 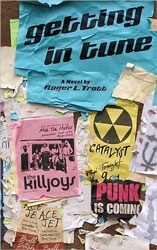 Anyone who’s been in a band can appreciate the details author Roger Trott uses to flesh out Dan’s dysfunctional family of musicians. Dan is too full of personal angst and confusion to effectively manage his role as ad-hoc band leader, and finds himself struggling between following his own desires and keeping the peace amongst his colorful bandmates -- a frontman so obsessed with Mick Jagger he calls himself Mick and affects a phony British accent; Yogi, the aw-shucks drummer who lives with his parents and goes whatever way the wind blows; Rob, a bassist with girlfriend issues (like, wanting him to quit the band); and sax man Sam, who like Dan, just wants to play music. Their band The Killjoys has made a name locally playing high school dances and local clubs, but Dan has bigger ambitions. He also senses a change on the musical horizon; creeping into the Bay Area music scene is a yet-unnamed flavor of stripped-down, no-frills rock that we’d soon come to know as punk rock. The band still churns out covers of radio favorites, but Dan is beginning to feel the urge to stretch out in ways that may jeopardize the future of The Killjoys. Complicating this is an intangible sense of something missing, a nebulous lingering want that he only identifies is as “the universal chord.” Daniel’s spiritual and musical guide comes in the form of Pete Townshend, who comes to him in dreams and in hallucinatory Benzedrine whispers, a sort of prodding, demanding Jiminy Cricket always pushing Daniel towards “the universal chord.” As a big Who fan I got a kick out the idea of Pete as a muse, smirkily taunting his young protégé. The story centers around a trip through the nether reaches of Washington State to a week-long gig at the oddly named Mai-Tai Hotel, where legend says Hendrix and Heart played when they were on their way up. Trott nicely mixes up the classic road-trip narrative line with a kind of pot-fueled caper story as the band makes its way to Puente Harbor, WA, whereupon they encounter a bar full of bottle-throwing bikers, rub elbows with fickle and intrusive wanna-be groupies, engage in drunken hotel hijinks and dodge skeezy band promoters. At first ignored, the band makes its mark and by the end of their gig is filling the small club to thunderous approval. An unexpected boon falls in their laps in the form of an invite to fill the opening slot for a formerly local band that’s back in the area on a national tour after their previously booked supporting act quits. Here’s the big chance Dan and the band wanted, but the morning of the show finds one of the guys in jail and all sorts of other chaos surrounding them.